The CUNY Coalition Against the Cuts was a citywide coalition of CUNY student activists that reached its peak in spring 1995. 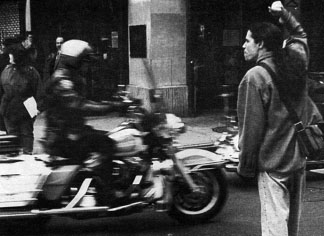 The CUNY Coalition is best known for its “Shut the City Down” protest on March 23, 1995, when an estimated 25,000 young people packed City Hall Park. Many were beaten, pepper sprayed and arrested by Mayor Giuliani’s police force while attempting to march on Wall Street. Governor Pataki’s proposal for budget cuts and a tuition increase was modified shortly after the protest, and his plans to eliminate SEEK and College Discovery were scrapped. Go to all 20 Items in collection. This black and white flier has a picture of Wynetka "Ann" Reynolds, chancellor of CUNY. Activists chose the chancellor as a target to draw attention to their struggle for access to CUNY and quality public education.